It is the fixture that triggers the rush of adrenaline amongst the club members and supporters, as it encapsulates a distinct essence in the wake of the real rivalry breathing between the English giants. Nevertheless, the final whistle blew in the favour of the Mancunians after an exhibition of a balanced second half at Old Trafford. 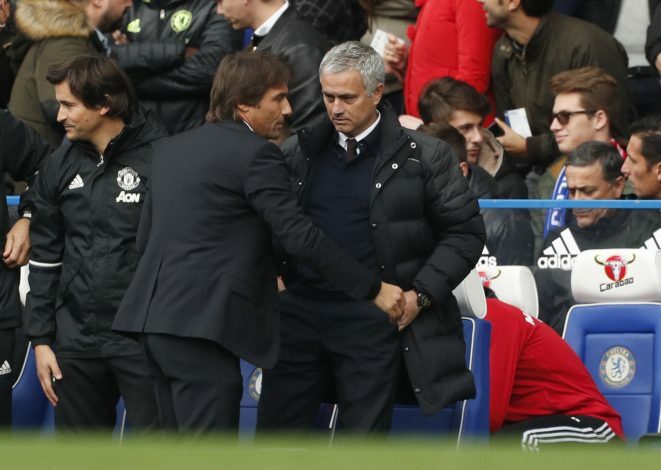 Disregarding the fact that Jose Mourinho demoted their fixture against Chelsea to the ranks of “any normal game” a little while back, the performances displayed by either team stood on equal footing, although the Portuguese enjoyed the three points at the end of the clash. The ex-Chelsea boss had also claimed that his memories of his former club and the success he savoured there were fading with each encounter. Be that as it may, Man Utd undeniably couldn’t establish their supremacy up to the gaffer’s desired extent, with the visitors dominating in terms of possession and the chances created. Regardless, the result would indubitably sting a bit for Antonio Conte, as they have dropped further down the table, making it more difficult to ensure the Champions League qualification spot this term. A six-point lead over the defending champions will definitely serve as a reassuring step for the former Porto manager, with a substantial game against Liverpool looming over in the coming weeks – a fixture that has been marked on their calendar, packing extra significance primarily owing to the lesser point gap prevailing between the arch-rivals. The Italian tactician sprang off the match with their customary 3-4-3 formation which saw Eden Hazard, Alvaro Morata and Willian driving the Blues from up front. For the rest of the squad, the prolific boss made just one change from their midweek Champions League lineups, as Danny Drinkwater replaced Cesc Fabregas. The offensive line-up naturally helped them press hard against their opponents in the first few minutes of the eventful tie. However, for what it’s worth, the intense pushing bestowed them with two corners and a shot striking the crossbar early on into the match. The formation exhibited an impersonation of the plays they pulled off during last year’s campaign to an extent. Hazard was designated to operate on the left wing where he could make use of his technical skills to the fullest. The availability of Marcos Alonso behind allowed him to make relentless runs toward the centre, as the wing-back kept Antonio Valencia at check for the Belgian. The No.10’s inward movement permitted him to either play quick exchanges with the players available there or pass back to the left flank, where the Spaniard would’ve already made the run to be in a position to cross the ball into the box. Meanwhile, Mourinho started off the match with a 4-3-3 formation, polished by Martial, Lukaku and Sanchez, who comprised the offensive line. Despite a few crucial mistakes, the availability of four defenders facilitated them to restrain the visitors from producing as they pleased. Plus, by deploying Matic in the centre midfield, the United gaffer achieved more control in the opposition’s half. Amidst the match, the Red Devils were even noticed making use of a man-to-man defensive tactic in the midfield, trying to close down the opposition’s offensive build-ups from behind. However, they discerned Kante as an obstruction to launching their own advancements throughout the match whilst effectively guarding against the opposition’s counter-attacks. After taking the lead in the second half, as one would’ve undoubtedly expected, Mourinho parked the bus with only fifteen minutes of play left in the remainder of the ninety minutes. The Special One introduced Eric Bailly by switching out Alexis Sanchez, which ensured him the victory. Although it raised a few eyebrows, Mourinho fielded the youngster beside Matic, which turned out to be crucial for the triumph enjoyed by the Mancunian giants. The 21-year-old played a significant role in pocketing Hazard, as he marked the Blues danger man throughout the fixture. The gifted figure bossed the midfield by holding with Matic while allowing Pogba to advance forward, providing fluidity to their football. The talented starlet has enticed much attention on grounds of the quality performance he has showcased, bullying even the world-class talent. The United boss entrusted the laborious job to the youngster, where he produced a similar noteworthy performance as that of Ander Herrera’s the last time around. The young midfielder dazzled the gaffer likewise in his side’s Champions League clash against Sevilla midweek, where he was deployed to keep Ever Banega at check. The series of remarkable performances displayed by the academy graduate could provoke the manager to provide him with plenty of opportunities in the midfield in the future. With either team having seemingly reached an impasse as the scoreline stood 1-1 for a while, Mourinho decided to break the deadlock by introducing Jesse Lingard, consequently forcing off Anthony Martial. The English international headed his side ahead with quarter-of-an-hour to go, having nipped between Azpilicueta and Christensen to meet a gentle Lukaku cross. The extra pace the 25-year-old had was made use of really well by the United striker. His presence changed the flow of the game totally, as the Italian boss appeared to be a little late to make the substitutions. Conte could’ve secured a draw, if not a victory, if he had brought on Giroud earlier. Morata, despite the awful performances he’s been showcasing, was entitled to play when the winter signing rested on the bench for the majority of the ninety minutes. Clearly, viewing the physicality of the United defenders, Giroud would’ve simply been a better choice, however, the delay in his own actions cost him a much-needed three points.